'Magic pill' against anti-Semitism evokes smile from PM, highlights need to battle hate crimes in France. 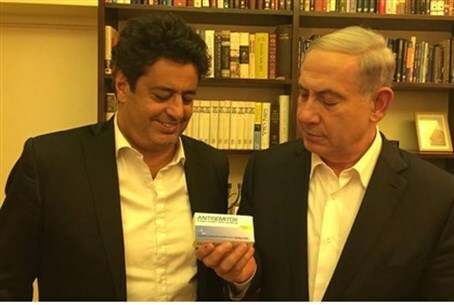 Prime Minister Binyamin Netanyahu and French MP Meir Habib met in Jerusalem Monday, where Habib introduced the Prime Minister to a viral campaign making waves throughout the French Jewish community - a "magic pill" to fight anti-Semitism dubbed "Antisemitox." "Antisemitox," a project from the Organization of Jewish Europeans (OJE), is real - but not medicative. Boxes of the honey candies with the special package, designed to raise awareness over France's anti-Semitism epidemic, are on sale online for 5 euro ($6.11). Money from the campaign will be donated to organizations in France that fight anti-Semitism. "The honey candies contained in the packages work to immediately soften the anti-Semitic words and behavior that are the first symptoms," OJE said in a statement. Each box contains three honey candies, detox patches, and the text of the law stating the penalties that apply to people who express anti-Semitism publicly. "These include insults, curses, aggressive behavior, hallucinations, and quenelles (Nazi-style salute popularized by convicted racist and comedian Dieudonne M'Bala M'Bala - ed.)." Photos of the "drug" have quickly made their way across social media. OJE head Jean-Claude Zaret stated to France's TV Monde that the idea behind the campaign is to use humor as a means of raising awareness. "We talk a lot about Jewish humor, so why not use it to protect the Jewish community?" he said. "It was, for a few thousand years, our spirit to caricature ourselves and find solutions that are a little out of the ordinary [...] If we can explain to people that the Anti-Semitism is a pathological disease, punishable by law, it could reassure the community that is afraid." Antisemitox even made Netanyahu smile, after Habib presented it to him after a meeting between the two over the Palestinian Authority (PA)'s statehood bid in the UN. "This is a humorous campaign, but unfortunately there are several symptoms," said Habib. ''These days we are faced with a terror attack in France, antisemitic attacks daily, and the threat of French nationals becoming Jihadists. This problem requires intensive treatment - otherwise we risk seeing the situation destabilizing again, e.g. with the Jewish school [shooting in 2012 - ed.] in Toulouse." Over the past week, France has seen a number of "car rampages" and massacre-style attacks by jihadists. On Saturday, a Burundi-born man, Bertrand Nzohabonayo, attacked French police in a suburb of Tours, leaving two officers seriously injured. Less than 24 hours later, a mentally ill man yelled "Allahu Akbar" before ramming his vehicle into dozens of pedestrians in the eastern French city of Dijon. 13 people were injured in that incident, which has been ruled to have no link to terrorism. And Monday night, a van rammed into shoppers at a Christmas market in the western city of Nantes, injuring at least ten people. The driver in that attack also allegedly shouted "Allahu Akbar" as he carried out the rampage.